The reason why the evolution of eDonkey was called eMule was because even though they where similar the second was more powerful than the first, something that is comparable to the differences between a real donkey and a mule. That is why when it came to developing a new client that had all the strength of the eMule network added to that of the BitTorrent network, the developers decided to name it after one of the strongest animals in the world, Lphant. The two most used P2P networks, that are also the ones that have the largest amount of files, together in a single program. Lphant has managed to combine the virtues of both networks to allow us to search for the torrents that we want in the main trackers and metasearch engines, and if it doesn't find it, it starts to search for it over the ed2k and Kademlia networks. 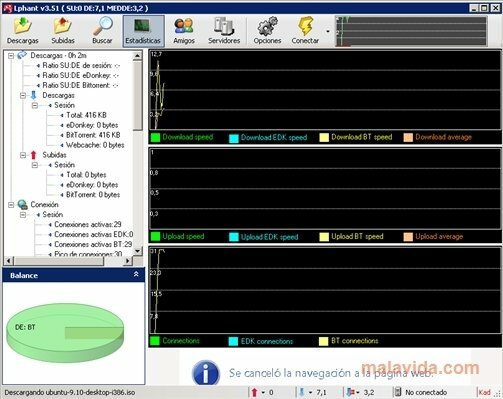 This function bestows the application with great speed, because it allows the files to be downloaded from various sources, preferably BitTorrent, thus assuring unlimited speed and availability. One of the most interesting functions is the possibility to control it remotely, thus allowing the user to keep track of the downloads without having to be in front of the computer that is running Lphant. Nevertheless, it's important to underline that the Lphant 4 download notifications have to be ignored, because after its purchase by Discordia Ltd., the client's P2P functions have been deactivated.